Last September 14th my wife and I left for a three-week tour of Ireland. On my third trip we restricted ourselves to a few areas not visited before – Dingle in Co. Kerry, NW Co. Clare and SW Co. Galway based at Kinvara, Connemara based at Clifden, and SW Co. Mayo based at Westport. We picked these areas on the basis of their traditional music as well as scenery. With fiddle in hand, I was looking forward to playing in many traditional sessions. Anyone traveling to Ireland should expect the worst weather and be happy with anything better. We were not disappointed; it rained almost every day! In between, however, there were a few dry periods and even a few sun breaks. We flew into Shannon, rented a car, spent the first night in nearby Limerick and then drove down to Dingle. Dingle is a prime tourist destination, and even though late in the season, it was full of tourists. We did the obligatory tours of the Dingle Peninsula and the Ring of Kerry (with surprisingly little tourist traffic). The evenings were for music, although most sessions don’t begin until 10 pm. The first session at John Benny’s consisted of a paid trio – banjo, guitar, drums. Even though it was amplified and not real session, I was welcomed to join in and even lead a few tunes. The next night I discovered a real session at O’Flaherty’s – a small informal traditional pub with flagstone floor, high ceiling, and walls decorated with pictures illustrating the culture and history of the area. The owner, Fergus O'Flaherty, is one of the principal performers. The session began with a flute player, a bodhran player and myself on fiddle, and was soon joined by a guitar player and O’Flaherty who played a masterful button-box accordion in addition to bouzouki, guitar, banjo, and was a great singer who could fill the room with his strong voice. Like all the sessions I attended in Ireland, I was welcomed to join in and asked to start tunes throughout the evening. The small pub was packed with patrons and the Guinness flowed freely. It was a great evening! During the day we stopped at the Dingle Record Shop owned by Mazz O'Flaherty, one of Dingle's best known musicians who played for years in the family pub O'Flaherty's. And as we walked through the town, I was stopped by a woman who asked if I was the one who played fiddle in O’Flaherty’s the other night, and complimented me on my playing. That was a nice gesture and illustrates the friendliness of the Irish people. From Dingle we drove to Ennis and then up the coast by Spanish Point, the Cliffs of Moher, through Lisdoonvarna (The Road to Lisdoonvarna is a well-known traditional tune and most roads in the Burren seem to lead there!) to Kinvara, a picturesque small fishing village on Galway Bay at the east edge of the Burren, a desolate rocky limestone coastal area of NW Co. Clare. Kinvara proved to be an ideal base for music and exploring the Burren and the city of Galway. The first night in Kinvara I played in a small session at Keogh’s. There were two other players – Elsa, a talented fiddle player from Scotland and university music student in Galway, and Rob, a great guitar player and singer who moved to Kinvara six years ago from Northern California. Tourists took pictures of us probably thinking we were all native Irish musicians! Again, it was great fun as I was asked to start tunes and also sang a couple songs. The next night I played in a session at Winkles. Elsa was there again with several other local musicians. Winkles has sessions every night but Monday, when the session is at Keogh’s. On Wednesday night there was a singer/songwriter session with about a dozen local singers. The songs were mostly original and contemporary, and well performed. I joined in with a couple of traditional American songs. And on Thursday night there was set dancing with beginner’s instruction earlier in the evening, and we also joined in. Kinvara is home for many talented musicians, and also the birthplace of Francis Fahy, an Irish poet and songwriter (1854-1935). 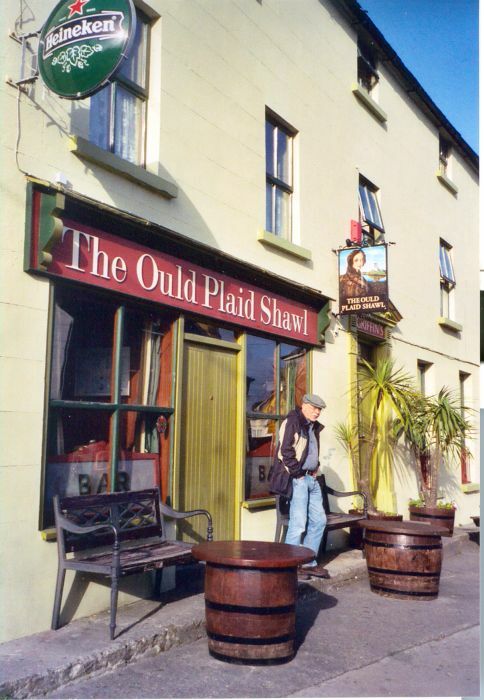 He wrote many well-loved songs, such as The Ould Plaid Shawl and The Queen of Connemara. His lyrics, like those of Percy French, capture the charm and humor of popular Irish songs in the early 1900s. There I bought a CD, The Ould Plaid Shawl, a compilation of many of his songs performed by local Kinvara musicians. On Sunday we drove into Galway to meet Linda, a former session-player friend from Seattle who recently moved to Galway, and Martin, a traditional singer I had met on an internet discussion forum. We met at a Sunday afternoon session at The Crane. The session leader was a whistle player who was recently honored for twenty-five years of playing in that pub. Again it was a friendly session, and welcome for its afternoon rather than late-night time. Martin gave me a CD, The Lark’s Loud Song, a nice collection of traditional songs sung by members of his South Roscommon Singers Circle. We collected many CDs by local musicians which we enjoyed listening to as we drove through the countryside. We left Kinvara and drove to the beautiful Connemara area NW of Galway. It is a desolate, but beautiful mountainous area with many small lakes and a rocky coastline. We chose Clifden, a coastal town, as our base. Mannion’s was recommended as the best place for a session. The first night we came at 10 pm for a “session” which consisted of a mediocre amplified trio (guitarist, button-box player, and singer) that performed “entertainment” with songs familiar to most tourists and corny Irish jokes – not my idea of a session. So we left early. The next evening, after talking to some Australians and Americans who were also disappointed with the entertainment, I decided to come early and see if I could play before the scheduled music. I was welcomed to play, which I did for over an hour. As I played fiddle and sang, more people entered the bar and seemed to enjoy my music as they applauded enthusiastically. After a while the bar owner’s brother came over, complimented me on my playing, and brought me a Guinness and later a choice Irish whiskey. Later when the entertainers came, they also complimented me on my playing. However, when they began the same set of tunes, songs and jokes as the previous night, we stayed only a little while to be polite and left early. Our final stay was in Westport, a beautiful seaport town just north of Connemara in Co. Mayo. The best place there for traditional sessions is Matt Molloy’s. Matt Molloy is the well-known Irish flute player with The Chieftains. This is a small, unassuming-looking bar, which consists of several small rooms, one behind the other. On Saturday night the bar was jam-packed with people and there was barely enough room to walk back to where the session was to begin. At 10 pm the session showed no signs of beginning, although I think I saw Matt Molloy walk through. It was so packed with a noisy drunken crowd that it would have been difficult to play, so we left. The next evening we came back to a less-crowded, more-reasonable scene. Before the other musicians came, an older local started singing. He was good and got others to join in. At about 10 pm several session players came – a fiddle player, button-box player, and stand-up bass player (and later a guitarist and an American mandolin player) – and I was invited to join. It was another friendly session. We drove back to Shannon on another rainy day, with a few dry spells and just a hint of sun, playing our new CDs on the car stereo, the end of another enjoyable trip to Ireland. We stopped at Kinvara to revisit this pretty little town before arriving at the airport hotel for our final night before an early-morning flight to London Heathrow and then Seattle. If anyone offers me another trip to Ireland I will go at the drop of a hat. I’d be happy to lead a tour or give advice. Ireland is a place which seems to draw one back again and again. Stewart Hendrickson is Chemistry Professor Emeritus – St. Olaf College, Research Professor Emeritus University of Washington, and in his new career, an unemployed folk musician (voice, fiddle, guitar; stewarthendrickson.com). Reprinted from The Victory Review, November, 2004.